Leaky Hot Water Tank | Butler Plumbing & Gasfitting Ltd.
No one wants to wake up only to discover that they have a leaky hot water tank. Whether you need a quick repair or an entire replacement is dependent on where the water is leaking from. Our skilled technicians at Butler Plumbing can quickly diagnose your leaky hot water tank and get to the root of the issue. We will walk you through the process and let you know exactly what we are fixing and why. With over 30 years of experience, we have seen every type of leaking hot water tank that you can imagine. Our knowledgeable technicians will get your home and office up and running again in no time. Where is Your Water Tank Leaking From? Knowing where your hot water tank is leaking from is the key to figuring out if you will just need a repair or a complete replacement. If you are unsure of where the leaking is coming from, our technicians will be able to let you know right away. They will then advise as to the best course of action. If you hot water tank is leaking from the top, your issue will most likely be remedied with a simple repair. However, if your hot water heater is leaking from the bottom, you will most likely need to replace your heater. An electric or gas hot water tank replacement can help to save you money because it will be more efficient. We can help suggest the ideal power vented or tankless water heater for your specific needs. 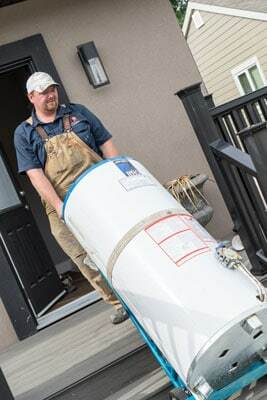 During the installation process, we carefully handle and install your new hot water heater and remove and dispose of your old tank. Your new hot water heater will afford you years of trouble free hot water with a new energy efficient tank. Your hot water will heat up faster and last longer! Our high quality service stems from our commitment to each and every customer along with a wealth of experience in heating industry. This makes us your trusted source for fixing a leaky hot water tank. We ensure that all of our technicians are up to date on the latest technologies, so they can give you the best possible service. We promise not to leave the site until you are fully satisfied that the job has been competed to your standards.